Today was the day a year back when I gingerly stepped into blogosphere, wondering what was in store for me on this virtual journey and for long I would be traveling. Well, its been a year now and so far so good. Believe me, I was blissfully unaware of food blogs for a very long time. In 2006, around May I peeked into Indira’s kitchen and was fascinated by what I saw. Time and again, I used to visit Mahanandi and other blogs linked to it. Fascination turned to desire and desire became reality on July 30th, just in time to participate in JFI – Flours. A couple of days before AkshayaPatra, I modified the template to suit my taste. I worked on it at a stretch for hours on July 30th and then came the naming ceremony. From my school days, I have been drawn towards mythical, mysterious things like the Akshayapatra – the vessel which has a never ending supply of food. Sai nodded his approval when I pronounced AkshayaPatra with a Capital P as the blog title. Thus began the journey. And Wow what a journey! Each of your comments inspired me to be better. The days when I got delayed responses from you were restless ones. And the days when you left comments were well, happy days! I learnt photography from Sai and my pictures became better as I went along. I started inventing new recipes and also trying out new ones. I was involved in cooking like never before and looked at food with a new angle of appreciation. My virtual contacts list grew, I even have telephone contacts with a few. However as the days went, my post frequency decreased due to various factors. Ill health, busy work life being a few. Even now I admire those who are as regular as a clock and am amazed at their energy, discipline and commitment. This year however, I have taken a resolution to post often and to reply to comments on time. With blogging came brushes with plagiarism. Yahoo, IfoodTv and recently Eenadu. The fight is still on and hope this year we bloggers would get some protection for our work. I thank all of you who took some time and visited my little place on the web. And I thank all of you who cared to leave a word when I published a new post and when I did not, wondering where I was, What I was up to and if I was ok. This is the energy which propels me to go on. Thank you so much. Keep visiting as always! I am a certified NLP ( Neuro Linguistic Programming) practitioner. I practice self healing and have found immense relief. I used to write stories from about 11 years and had a little book of my scribblings. However I simply couldn’t write from the second year of my college and that cloud lifted only after I started blogging. I hate to be waken up rudely or disturbed when I am sleeping. I despise it and cannot stand it when someone else is undergoing the same. I love early mornings ( 5 to 6.30 am)and late afternoons ( 2 to 4 pm). I love to see the sun rising and the sight fills me with hope. But I don’t take well to evenings or nights and sunset fills me with gloom and despair. Aircrafts fascinate me the most and I consider myself lucky to have worked in that domain. I cannot imagine myself having a dog or a cat for a pet, though my husband is a dog lover. This one is for AFAM hosted by Jai and Bee, the charming couple of Jugalbandi. And this is also the first time I am participating in AFAM, despite numerous futile tries before. We all love Watermelon, don’t we? And that brings to my mind an incident which was narrated by my landlady R when I was around 12. She was an elderly lady having the wisdom which village life bestows on its inhabitants and when we rented their upper storey in Vellore, it was customary for me to spend some afternoons with her over the weekends. During one such visit, I was given Watermelon and she proceeded to tell me the following story. In R’s village, watermelons grew in cemeteries and people despised or rather feared Watermelons, believing the redness of the flesh came from the dead’s blood. But this grandma who was an adventurous soul would bring a Watermelon home from the forbidden place, cut it up into bite sized pieces, add a sprinkle or two of sugar and keep it marinating in a pot. After dark after the family returns from work, she would take advantage of the darkness as there was no electricity and would serve them the further sweetened watermelon pieces. And needless to say, her people fell head over heels in love with the delicious fruit and proceeded to ask her for the details. And that was when this wise lady pointed out that they were indeed the dead man’s blood or WaterMelons. The jam turned out great, exhibiting a great color and flavor. Appearences are deceptive and it applies to Watermelon too. Despite the light and juicy texture, the flesh withstood heat very well and I had to break it up into small pieces and towards the end take the help of a hand blender to smoothen the jam’s consistency. I coupled watermelon with a hint of cinnamon to deepen the aroma. On a side note, watermelons are an excellent source of Vitamin C and are packed with Vitamins A and B6 along with powerful antioxidants like beta carotene and lycopene. So, while this big giant works as a great thirst quencher, it fuels your body with a powerhouse of nutrients. Cut the watermelon flesh into small chunks. Mix cinnamon with sugar. You can vary the sugar and cinnamon quantity as per your taste. Simmer the fruit, sugar mixture and lime juice. The fruit will start breaking down. There is no need to add water as the water from the watermelon is sufficient. Keep stirring as the mixture thickens and use a ladle to mash the chunks. When the mixture has reached the consistency of a jam, take it off heat and use a hand blender or a regular blender to grind it to the desired consistency. Return to heat and simmer for about 5 more minutes. Let cool and refrigerate. The jam will stay fresh for about 10 days. 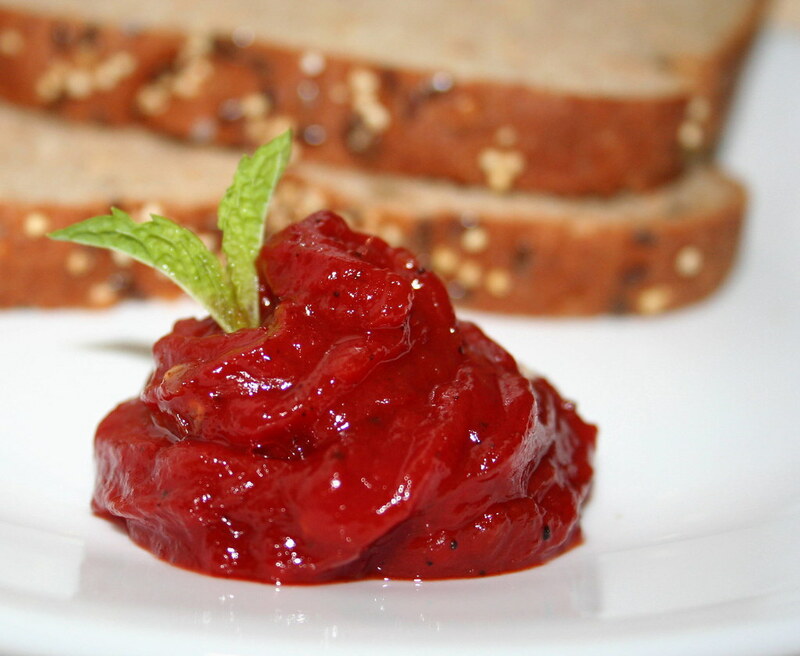 Check out another great recipe for Watermelon Jam at A Cracking Good Egg. It has happened again. First it was ifoodTv which stole my photos and now its the popular Telugu newspaper Eenadu which has stolen two of my recipes, Potato Sticks Curry and Poha Laddoo with photographs in their July 22nd issue. They have cleverly morphed the photos and published my recipes in their newspaper and website. This was brought to my notice by Ramya of Aromas Of My Food. My many thanks to her. I feel deeply saddened and irritated. Yesterday it was Yahoo now its Eenadu. Aren’t there any rights to protect us bloggers? Yes, our content is free for reading and trying out, but it is not to be stolen or exploited. Isn’t it? I have asked my people to get in touch with Eenadu. I demand an explanation and an apology from Eenadu and immediate removal of the plagiarized content or appropriate credits to be given. I will keep you posted. Meanwhile I request all of you, my friends to spread the word… Thanks in advance for all your support..
Last weekend was fun. 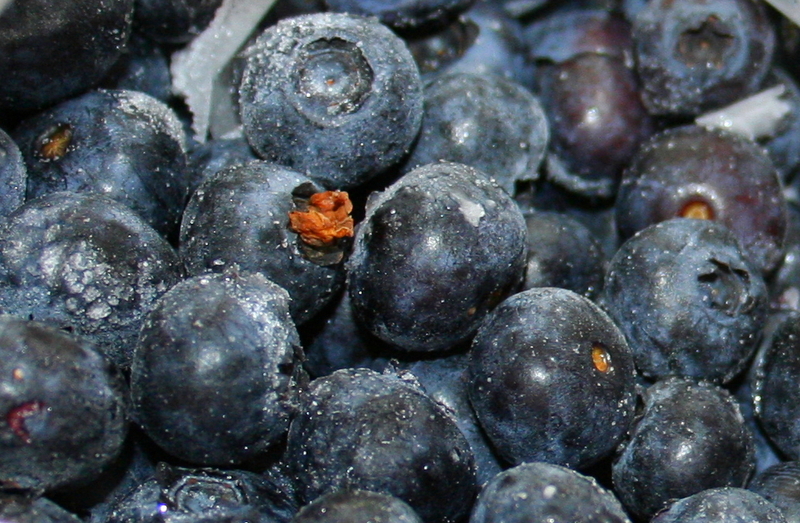 We had gone blueberry picking at Boyce Berry Farm, NJ. Fresh vegetable, fruit picking is what I love the most about summer. While apples are at their best during september and october, strawberries show up in their red garbs during may – june and blueberries are ready to be picked during July – Aug. My first picking trip was to Apple orchards. The fruit we picked were enough to last us for a couple of months. The following year, we were on our way for strawberries. But I didn’t have much forethought about storing and the picked lot was eaten, given away to friends and family to be relished. This year, I had my plans laid out for storing blueberries and on the very first day of picking, we were at the fields as early birds. And early birds get the worm! We got the best fruit, without much competition from fellow pickers. Added to the sweetness of the berries were the words of the landlady who said that the berries were not sprayed. We brought our bounty of 14 pounds home, promptly put them away in the freezer in ziploc bags and when they froze to marbles, we knew we had our year’s supply ready to made into milkshakes, stirred into cakes and muffins and to be had with cereal. The total cost of a pound including gas came to 2.50$ whereas at the stores, a pound cost 5.00$, that too not organic. And of course, add to it the fun, satisfaction and exercise you get from these field trips. If you had not gone picking, I suggest you do it right away. Pick Your Own Farms may or may not have an entry free. If the farm boasts of a bakery and hay ride, expect an entry fee along with it, though the hayride is really fun.